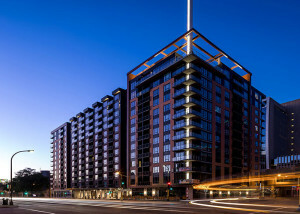 At 13 stories tall and with 409,000 gross square feet of building area, Latitude 45 is one of the largest recent housing projects in downtown Minneapolis. Two levels of onsite parking, one below ground, replace the surface parking that formerly occupied the entire site. 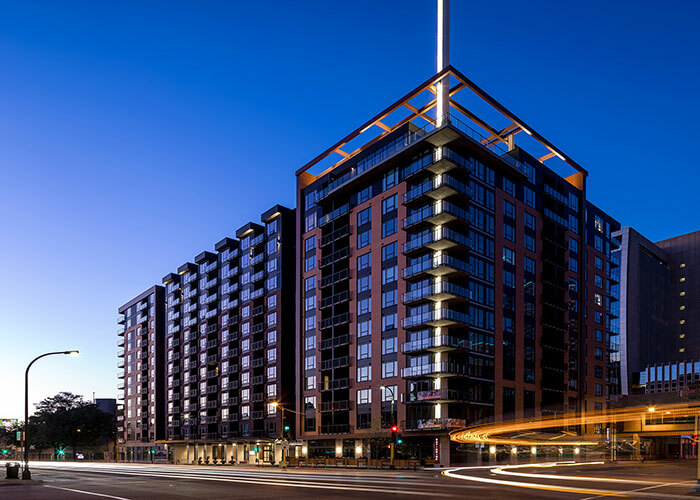 At the street level, a structured porte-cochere drive entry extends from Washington Avenue into the building footprint, creating a safe place to drop off guests at the chef-driven restaurant and first floor retail. The building is further connected to the city, with access to the existing skyway system from the club room. At the amenities levels, articulation within the concrete floor slabs allows for several separate outdoor terraces which include a pool, lawn bowling and a dog park, all over occupied space. Almost all of the 320 units enjoy a private concrete balcony. Extending up from the north corner of the penthouse level Sky Lounge, a 70 foot tall, fully lit, cast-in-place concrete spire acts as a beacon within the city. Structural systems included spread footings, concrete columns and shear walls, and cast-in-place post-tensioned concrete floors and roof.